Last month, Series Director Tetsuya Nomura teased that he and his team were preparing one more commercial to promote KINGDOM HEARTS 3 before its release on January 25th, 2019 in Japan. It has since been confirmed that the commercial would be aired during the 2019 Soccer AFC Asian Cup: Japan vs Uzbekistan TV Asahi 60th Anniversary show. Watch the new commercial now! That last shot. Why you doing this to me, Nomura? Also, Apollo and Athena in Olympus! 10/10 best game ever made. KH3 is the funniest game in the series, Nomura said. Well, I can see that from the thumbnail! Jokes aside, is this very spoiler-y? I feel like I shouldn't have seen this coz of that ending, but on the other hand it got me so hyped. Gotta love the other Olympus gods being present. Athena with her owl etc. And of course MX has to do the wiggly finger blues again, lol. Do the No Name-Replicas floating around MX NOT have the Master's Eye inside their tip??? Too bad I can't turn on sound yet as I'm still at work. The gods, the NPCs in San Fransokyo, that T-Rex heartless? Frozen looks SO good. Good to finally see Elsa in her post Let it Go attire! Just all reinforces that we have not seen much of this game compared to how much content there actually is. So excited. 7 Days. We HAVEN'T EVEN CRACKED THE SURFACE ON GAMEPLAY FOOTAGE AND IM HERE FOR IT!!!! It's hard to tell in that shot, but they have them. Thoughts on this possibly being released as the English launch trailer? What is Sora saying at the end? Ah yea, after the third watch I realized that too so my eyes were playing tricks. So MX is surrounded by twelve of those while he holds the 13th (or should I say the 1st?) in his hand it seems. One thing I do notice seems to be that there are two different locations used in the Keyblade Graveyard as in these scenes here and those where the massive Heartless army is they seem to be located in a canyon of sorts with many natural rock formations, unlike some of the others (like the clash of the two Rikus) where they're clearly within those ruins. Xehanort: This world has failed! Frozen's graphics look SO good. I think it has the best animation and rendering compared to other Disney worlds so far. I believe Disney asked and helped SE on giving special treatment for Arendelle alone. I would die. Elton John-Hermes cracks me up. He is also the funniest God to me behind Hades, lol. I need subtitles... Even if they're in japanese. I need them. Oh man, Olympus is looking mighty impressive and to see some of the other gods (Apollo, Athena and her Owl) and not just Zeus is such a good feel, here to hope that Keith David voices Apollo as compensation for Princess and the Frog not being in as a world even if it's just a few lines of dialogue. Even the scenes in Arendelle with Anna and Elsa look so close to how they looked in the original movie. Come to think of it, I'd say this could give the original movie a run for its money especially with how good they animated the details on Anna's hair. I know right, I'd say it gives the movie a run for its money. Even Anna especially on her hair looks a lot different to how she looked in the E3 and TGS trailers respectively along with her Render from the Square Enix website and promotional material. Also so this is the FIRST we've seen of Elsa in her Snow Queen outfit outside of the promotional KH3 material, cause in most of the trailers she has been in her Coronation outfit. Who knows, It would be nice to get an English trailer similar to the one we got, but given Square Enix's US department who knows. We can hope for a launch trailer/commercial similar to the one we got today in time for the January 29th release for the rest of the world. This edge is just too sharp to handle. Toy Story confirmed to have the same plot as BH6. Goofy rushing in with his shield was pretty cool, though. Good to know the other Gods are around on Olympus. Master Xehanort blocks Soraâ€™s attack and throws him down so easily haha. Get rekt. All those meteors during the gummi ship sequence reminded me of the the Milky Way. All the new scenes! Very welcomed. Man, the detail in PotC is insane. The world's look like they're brimming with life; I absolutely love how many NPC's are being included! I like this ad. It shows a few new things but nothing that makes me feel I've seen too much. Perhaps the org members become No Names to be "reborn" in a new world. Kinda creepy if that's the case. In a weird way the scene with Buzz being controlled by Young Xehanort feels like a kid just playing with his toys. The kid being Xehanort and the toys Sora and the others. I got chills seeing Sora cross Keyblades with Xehanort. Can someone provide a good quality screencap of that? It was like seeing Cap grab Thanosâ€™ hand in the last Infinity War trailer. Awesome. Especially with Frozen, I'm actually very impressed on the animation, rendering and details of Anna and Elsa look remarkably close to their movies counterparts. Come to think of it this is the first time we actually see Elsa in her Snow Queen outfit aside from the render used in most promotional material for KH3. Because it's a good character being turned evil and needing to be rescued, just in a slightly different way. Within the larger context of the game where the presumed justification for BH6 is that Baymax = Dark!Aqua and Sora will learn something from that confrontation which enables him to rescue her, Toy Story could serve exactly the same purpose. There's also the "alternate dimension" contrivance courtesy of Young Xehanort, rendering BH6 pretty much totally redundant from a narrative standpoint. Add in the fact that it doesn't look like there's much/any involvement from the BH6 cast aside from Baymax and there's nothing especially distinct or interesting about it. Why did something like this hit me right in the feels so hard? Delusional. That's not even the maim theme of the Big Hero 6 World. OK. And what is the main theme of the world from your perspective? Sometimes I really wonder what you see in old KH games. They've always been shallow. Let's assume this is an accurate assessment, just for the sake of argument. Previous KH games were good at drawing from a wider pool of shallow Disney source material in order to at least provide them with the illusion of depth. KH1 utilized its limited world selection to provide both a classic Disney experience while also incorporating relatively left-field properties like Nightmare Before Christmas while KH2 expanded its world selection such that an even greater variety of styles and aesthetics could be applied to the formula, from the digital frontier of the Tron universe to Timeless River. So in a comparative evaluation of the series in which we allow for the unevidenced assertion that "they've always been shallow," KH3 even still manages to rank as a substantially shallower entry among the main installments. In my opinion, KH3 is aesthetically and thematically pushing way past KH2. KH2 brought in a whopping TWO new Disney properties for worlds, and the theme in nearly every single one was "Sora misses Riku and Kairi". KH2 didn't have any classic films featured as worlds, everything was from the renaissance. KH3 will likely continue to use Disney as a mildly amusing backdrop for adventures and shenanigans, with the added benefit of actually having good environmental design and some mildly interesting setups for characters. I don't know how you can watch scenes from Toy Box and think "man, KH2 was so much better". We have a party member who is a willing and trusting participant, and a party member who is looking for the first opportunity to leave. For once we get to see a world local be a complete and utter skeptic of everything Sora and company do. Aesthetically, yeah, sure, we have three modern CG films being represented. I've often been critical of Disney for reusing Tangled's look so much, but what's really the solution, here? NOT using the giant snow mountain world? NOT going to the giant futuristic urban cityscape? Because the characters look too uniform? That'd be a really petty and wasteful attitude when picking levels for a game. I'm surprised that nobody is talking about the fact that Anti-form is returning in the form of Rage Form. As a Xehanort fan, I am ready to carve Xehanort into tiny pieces for hurting Sora. Also Sora crying to Riku about what he should do just...hurts. It hurts, a lot. I legitimately cried this morning because of Sora. Kingdom Hearts has made me soft. Listen to your heart. You know the (sad) answer. I'm surprised, but not particularly enthused. I never understood Anti-Form in KH2. It was boring to use, floaty, hard to control, and the simple act of attacking put you in an immediately vulnerable state. I know it's supposed to be punishment for drive abuse, but it could have at least had some kind of reward in an offensively useful moveset. I think that was the intention, but they missed the mark. If the new Anti-Form, or 'Rage-Form' manages to be any better, I'll be surprised, given Osaka team's shoddy work on command styles and dream links. 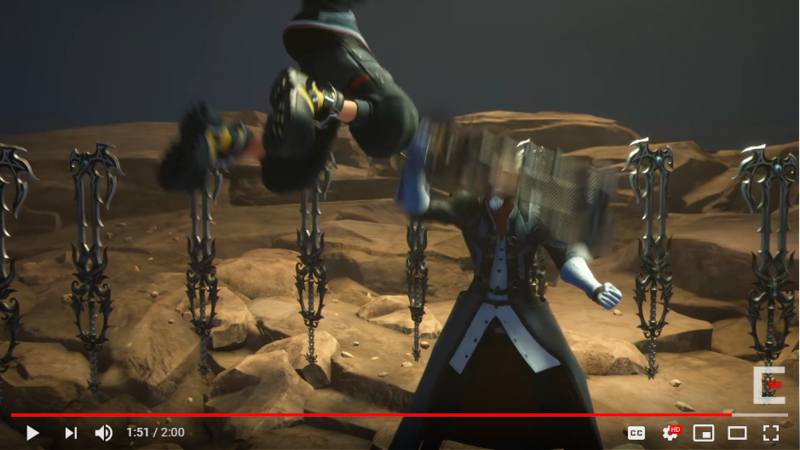 They've improved a lot for KH3, but this Rage Form could still go either way, so I'm just neutral. I liked the idea of Anti-form. And it seems like rage form is an option now instead of forced since the rage form prompt came up in the final battle trailer I believe. It is floaty but I always liked how the attacks looked. It just sucked during boss battles lol. Im just excited to see another form aside from Second form. Yeah I also kinda don't like Anti-Form to begin with so I can't say I was actually enthused to see it return lol. I am surprised they are being so open about the plot beats at the end of this trailer that was shown to the general audience? I guess they showed Sora stabbing himself in KH1 trailers though so I guess this has always been a thing. Still makes it really kinda obvious what angle they are going for in those moments, I just hope it doesn't last throughout the rest of the end-game. The majority of KH1 worlds were variations of â€œSora teams up with [insert hero/heroine] to stop [insert Disney villain] who has gotten in too deep with the Heartless.â€ In KH2, we had variations on â€œSora reunites with old friend to refight resurrected KH1 villainâ€ and/or â€œSora has to stop Pete or Organization from creating a powerful Heartless.â€ In BBS, thereâ€™s Dwarf Woodlands and Enchanted Dominion which have the same basic premise of a witch putting a young maiden under a sleeping curse until sheâ€™s woken up by true loveâ€™s kiss. This also. Plus, previous KH games made almost every Disney property look the same in how they were rendered in 3D. In KH3, we actually have a variety of art styles with Pixar, Disney Revival, 2D converted to 3D, and live action. Plus, the tribute to classic black and white shorts through Classic Kingdom. After watching it a few more times I can't shake the odd feeling that for the sake of having this grieving Rage Sora the characters he supposedly saved will be thrown back into suffering just for that purpose which somehow doesn't feel right. What's the point of the whole endeavour if it gets already thrown out again figuratively 10 minutes later? It reeks of creating drama just for the sake of it instead of actually doing something meaningful. Good thing it's just a weird feeling you have and you have no concrete proof that it actually happens, huh? Yea, I'm totally ready to be positively surprised. Maybe I read to much of some of the fears posted in different corners of the net. No ones talking about it probably because it was like the first thing the leaker showed weeks ago so some people think itâ€™s old news. I have a soft spot for the "super-powered evil form" trope, but I hate it when games punish you for doing what it wants you to do. They knew Drive Forms could be easily abused but added fake difficulty instead of addressing the issue. Don't know how I feel about Rage Form yet since we don't know the details, but if it's just another way to fight and not a punishment then I'll be fine with it. I think what we should really talk about is how Sora is so freaking angry, he jumps fifteen feet just to assault an elderly crazy psychopath. God I can't wait for Xehanort to die. You mean he's reacting exactly like Terra in the BBS finale? So Verum Rex is about Transformers-like robots? Does anyone know what sora says through the the commercial? So Hermes apparently appeared? Where? He didn't. People are hoping he does because Apollo and Athena were shown in the trailer. I do remember seeing people say stuff like this when another trailer came out recently, and I still echo what Sign is saying. But I thought Swoosh said thisâ€¦? Sora locking Keyblades with Xehanort was amazing. Like Cap grabbing Thanosâ€™ hand. Anybody have a good quality screenshot of that because maaan. Well, it's an ambiguous sentence if we read "could" as a past simple (which I did, lol). Disney is so protective with what happens in their properties while Pixar is just "murder them." Sora's screams in both versions are just amazing. I hope the developers and the actors are proud, because I've been waiting for emotion like that as a fan of the series for years. Willa's improvement was good, but that acting from Haley Joel Osment... wow. So much better than 3D. Seriously! Even with the cheesy lines from the Pirates trailer I'm more than excited for his performance in this game. If we get stuff as good as that scream throughout the epilogue I'll be more than happy with it. That scream also hurts because we've known Sora as this bright, optimistic kid who always tried to stay positive, so seeing him screaming like that is devastating. It makes me both hyped and scared to know what exactly happened. The 2 Minute CM is #30 on YouTube Trending in the U.S., a Japanese commercial mind you. By the way, just something I found interesting. Kingdom Hearts' Instagram has 335K-ish followers. As far as my research showed, that's on the VERY high side for a game franchise Instagram. The only franchise I could find with more with an Instagram account was Halo, at about 380K, while the franchise Red Dead, Call of Duty and even Final Fantasy had only around 120K if I remember correctly. Pretty neat! Young Xehanort made a copy of their world. The Buzz we see isnâ€™t the real Buzz, but a copy. Most of the cutscenes for Toy Story have been out for some time. Gasps Wait a Minute Young Xehanort made a Copy of the Toy Story World and the Buzz Lightyear that was with Woody wasn't the Real Buzz but a Copy? [spoiler]We donâ€™t know yet (or at least I donâ€™t know), but one can shoot lasers/fly and do the imaginary things from the movie, but the other cannot. There are two Buzz Lightyears. We donâ€™t know yet (or at least I donâ€™t know), but one can shoot lasers/fly and do the imaginary things from the movie, but the other cannot. There are two Buzz Lightyears. There are videos that predate the current leaker that show most of the intro cutscenes (8 months ago). Iâ€™ve added spoiler tags. Besides I donâ€™t know if thatâ€™s right. Itâ€™s just an educated guess. There are videos that predate the current leaker that show most of the intro cutscenes. Iâ€™ve added spoiler tags. Besides I donâ€™t if thatâ€™s right. Itâ€™s just an educated guess. If youâ€™re referring to the footage from the extended demo at the Premiere Event/TGS panel, none of those videos suggest that thereâ€™s a second Buzz. Thereâ€™s been nothing to support it based on official press materials. Iâ€™ll assume thereâ€™s been a crazy misunderstanding that led to your arrival at that conclusion but please be very careful. We have less than 2 weeks until release. And lets keep the spoiler/leak discussion out of this section? We gave you the entire Spoilers section for a reason. There's nothing wrong with a continuation of themes through the worlds, on the contrary I think that's a good way to structure the world selection. It's also a little disingenuous to minimize the ways that KH2 expanded on those existing Disney properties which it did draw from (it had much more than two new worlds, but nice try), which worked in its favor and allowed a number of character arcs from the first game to be brought full circle. Ultimately there has to be a sense of advancement and momentum behind the ideas driving each level (which are functionally chapters in these games), and in KH1 and 2 it's clear how that's occurring because there is a central design pushing our protagonists towards a final destination, and an intriguing entry point for us as an audience. In KH1 it's the mystery of the Keyblade, in KH2 it's the mystery of the Organization, both grounded in a hypothesis about the heart's true nature. KH3 seems to lack that; while the New Org. is at work in the worlds they're for all intents and purposes a known factor at this point, so the question becomes why Sora, Donald and Goofy are making visits to them, and we haven't been provided with a particularly strong answer for that. The Key to Return Hearts is an obvious MacGuffin but it isn't compelling because it's nebulous: the Keyblade and the Organization were both tangible forces in their respective games, whereas the Key to Return Hearts is probably just something obvious and unexciting like Sora's "light" or the thing in the box or whatever. That's why redundancies in the premise are so concerning: it's time wasted which could be used to expand the sense of scale with regards to the final conflict, which is now the foundational mechanism for all drama in this game. KH3 will likely continue to use Disney as a mildly amusing backdrop for adventures and shenanigans, with the added benefit of actually having good environmental design and some mildly interesting setups for characters. Not a particularly accurate description of pretty much any world in KH1, but yes, KH2 was flawed in its implementation and it became formulaic. I don't know how you can watch scenes from Toy Box and think "man, KH2 was so much better". I don't. I think that the world selection and variety in KH2 was better and more expansive, but that's a claim intended to counter your assertion that we should only consider a difference in degrees of superficiality between each title. We have a party member who is a willing and trusting participant, and a party member who is looking for the first opportunity to leave. For once we get to see a world local be a complete and utter skeptic of everything Sora and company do. It's also not such a stark or necessary shakeup in the usual routine that I think it makes much of a case for a world's appeal in any meaningful way. Not when it's at the expense of real divergences from the norm like a Fantasia themed level, or a space adventure, or a secluded, intimate getaway spot, or a dreamscape unrestrained by everyday logic. But yeah, I'm sure Toybox will really stretch every bit of entertainment mileage out of Buzz's sedated, apathetic posturing. Yes, the solution would be to replace some of the redundant worlds with locales that would be just as visually appealing and luxurious (and which everyone would be drooling over regardless) but don't play to exactly the same type in terms of narrative substance. It's much more petty and wasteful to include a world like BH6 which has been actively downgraded from its potential in order to make the cut just because it's popular or "new." It doesn't add anything notable to the game and given the limited lineup to which this game's developers all knew KH3 would be relegated, the first consideration should have been how to avoid retreading ground which has already been covered. BH6 is not an awful, very bad world, it's a solidly mediocre one that would have slotted just fine somewhere around the middle portion of another game that had enough of its own knockouts to make up for it. As it is, it's simply not good enough to effectively register as the (probably) final Disney world of what should be the final KH game. It's certainly possible to generalize the throughlines that characterize each world in each game, just as it's possible to do so with each installment in the series. The contention is not that structuring the worlds using the same overarching motifs is a bad idea, but that utilizing resources to construct a repetition of premise when its resolution is easily achievable in one iteration weakens the momentum and sense of purpose behind a conflict. Disney's computer-generated look is fairly standardized and generic, there are methods for doing non-uniform CG but Disney-Pixar is not practicing them. 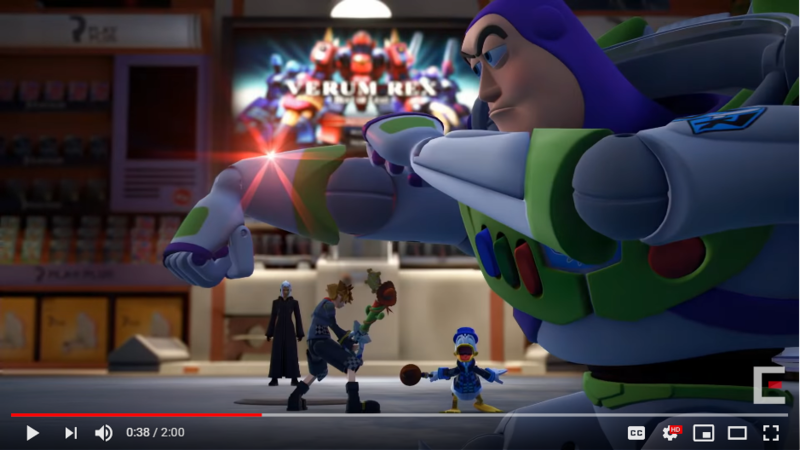 The reason KH3 has an appearance of visual variety when compared with past games is due to advancements in technology that allow for more detailed environments and the introduction of dynamic lighting: we would see an even greater range of this if they had brought more classic titles to be reconstructed in this new engine and took the time to do them justice. Olympus is one of the more gorgeous environments in this game because it's based on a movie with very distinctive art direction, whereas Sora could literally just walk across the forest of Corona into the snowy tundra of Arendelle and aside from the drop in climate there wouldn't be much by which to tell them apart. Same with BH6 and Toy Story; if Sora didn't transform for one, there wouldn't be much of a contrast between the two. There's also the "alternate dimension" contrivance courtesy of Young Xehanort, rendering BH6 pretty much totally redundant from a narrative standpoint. Add in the fact that it doesn't look like there's much/any involvement from the BH6 cast aside from Baymax and there's nothing especially distinct or interesting about it. It's not like one plot is a disappearance plot that ends with someone being turned against the others and the other is a relatively standard superhero plot about fighting giant monsters and a dark version of one of the heroes or anything.